In mid-twentieth century Britain, four intellectuals - Julian Huxley, Bertrand Russell, Malcolm Muggeridge, and Barbara Ward - held sway over popular conceptions of morality. While Huxley and Russell championed ideas informed by agnosticism and atheism, Muggeridge and Ward were adherents to Christianity. In Contesting the Moral High Ground, Paul Phillips reveals how this fundamental dichotomy was representative of British society at the time, and how many of the ideologies promoted by these four moralists are still present today. As world-class public figures in an open forum of debate, Huxley, Russell, Muggeridge, and Ward all achieved considerable public attention, particularly during the turbulent 1960s. Phillips captures the rebellious spirit of the time, detailing how these thinkers exploited the popular media to disseminate ideas on prevailing social issues - from justice and world peace to protection of the environment. Phillips skilfully traces the foundations of their thought to their earlier careers and social movements of previous generations, and shows how many of their approaches were adopted by a host of present-day groups from the Christian Right and Left to the New Atheists and environmentalists. 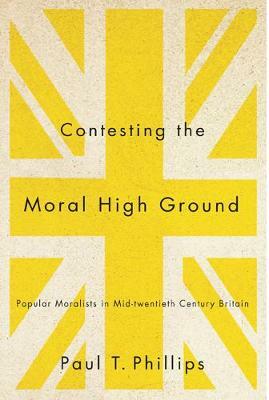 A significant contribution to British intellectual history, Contesting the Moral High Ground provides new insights into the moral philosophies of four of Britain's most influential minds in the twentieth century.